Grains are weaker overnight. Corn is down 1 ½ cents, beans are down 2 cents, and wheat is down 3 ½ cents. Weekly US corn export sales are est near 400-800 mt, soybeans 300-700 and wheat 200-500. According to some ag economists, if the U.S.-China trade war persists, the U.S. could lose 9 million acres of beans to Brazil permanently. In September China has imported 30% ($3.6 billion-worth) of their food and ag products from Brazil, while the U.S. accounted for only 5% of imports at $625 million. Rains have developed in the west overnight, dropping mostly light amounts on the WCB and southern Plains (heaviest in central KS and NE at 1-2”) and are moving into the central and southern belt this morning. 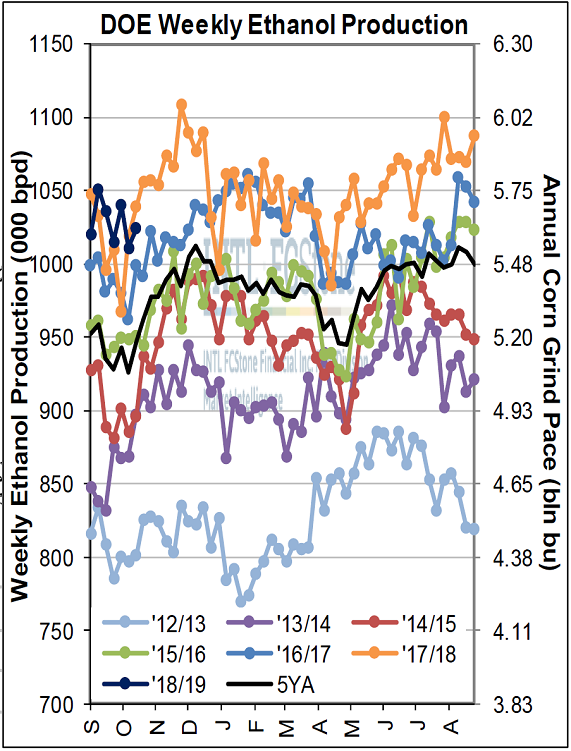 Weekly total U.S. fuel ethanol production rebounded by 13,000 barrels per day on the week ending last Friday (10/19), to 1.024 mln bpd, but that still came in below the comparable week last season at 1.039 mln bpd. However, that previous week’s low at 1.011 mln bpd came a full 44k bpd above last year’s early-Oct production bottom, with the seasonal increase LY measuring over a +140k bpd into early Dec. Cumulative output (1.028 mln bpd) so far this season remains safely (+12k bpd) ahead of last year’s pace.